At the beginning of October a small cluster of seismic events was recorded by the permanent seismic network of the Osservatorio Vesuviano (figure 4). The most energetic event of the sequence occurred at 0741 on 9 October, with a duration magnitude (MD) of 3.6 and a Wood Anderson equivalent magnitude (MWA) of 3.4. This event was located in the crater area at a depth of about 3 km below sea level, with a preliminary stress-drop of 164 bar and a preliminary moment magnitude of 3.3. According to its MD value, this event was the most energetic of the last 50 years. Its fault plane solution showed a strike slip mechanism. All the events in this sequence were located below the crater area within the first 6 km of the upper crust, typical of seismicity at Vesuvius in recent years. Figure 4. Seismic activity at Vesuvius during 1 January-17 November 1999, showing the monthly number of events (histogram) and strain release (line). Courtesy of the Osservatorio Vesuviano. During the swarm no changes were observed in the temperature or the composition of the fumaroles, in the CO2 flux from soil, or in ground deformation. Both the temperature and the level of the water-table sampled around the volcano appeared unchanged. As of mid-November seismicity seems to have returned to normal low background levels (both in terms of energy and in number of events) that have characterized Vesuvius for several years. Information Contacts: Lucia Civetta, Edoardo Del Pezzo, Francesca Bianco, Giuseppe Vilardo, and Mario Castellano, Osservatorio Vesuviano, Via Diocleziano 328, 80124 Napoli, Italy. The Global Volcanism Program has no Weekly Reports available for Vesuvius. The Somma-Vesuvius volcanic complex is a central composite volcano formed by an older stratovolcano (Monte Somma) with a summit caldera partially filled by the composite cone of Vesuvius. The most noted eruption, in 79 A.D., destroyed the ancient cities of Pompeii and Herculaneum. Since the explosive sub-Plinian eruption of 1631, Vesuvius has erupted with both Strombolian and mixed effusive-explosive styles. For the past three centuries the volcanic activity has mainly focused inside the Somma caldera but occasionally lava issued outside it (i.e., 1760 eruption). The last cycle of activity ended with the 1944 eruption. Since then, the volcano has been characterized by moderate seismicity and intra-crater fumarolic activity. The Osservatorio Vesuviano maintains an array of short-period seismographs (eight three-component and nine vertical-component instruments). Seismicity was monitored during 1995 and March-April 1996. The 1995-96 period was the most active of the past fifty years. 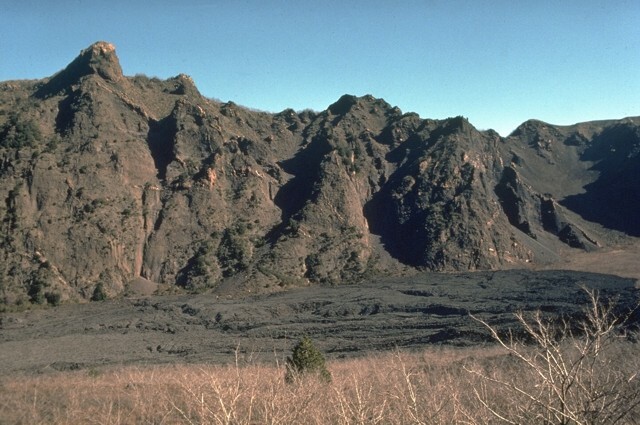 Several hundred microearthqukes (M < 3.2) were recorded during 1995, many from sources within the volcanic edifice above sea level. An increase in strain release and in frequency of earthquakes was observed from August to October 1995. During this period 217 events were recorded. Three of these earthquakes had M > 3.0 and were felt by the local population (~600,000 people): the first event (M 3.1, focal depth 3.1 km) occurred on 2 August; the second (M 3.2, focal depth 4.2 km) on 16 September, and the third (M 3.1, focal depth 3.3 km) on 24 September. Hypocenter locations for the past two years have clustered in a small volume below the crater area, no deeper than 6 km below sea level (figure 1). Focal mechanisms of relevant events suggested that the cause of seismicity was crustal rupture. Harmonic tremor and monochromatic low-frequency events were not observed. No changes in ground deformation or fumarolic gas compositions were reported. A Reuters news story noted that a geophysical experiment is planned at the end of June to obtain a tomographic image of the volcano. The report said that the experiment, a joint-venture of Swiss, French, and Italian scientists, includes a series of controlled explosions at 14 boreholes on the volcano's slopes and as far away as the Sorrento peninsula. The explosions will be monitored by a network of 250 seismic stations. In addition, a marine seismic prospecting survey will be carried out in the Bay of Naples to investigate the volcano's submarine flanks. Information Contacts: Lucia Civetta, Francesca Bianco, Giuseppe Vilardo, and Mario Castellano, Osservatorio Vesuviano, Via Manzoni 249, 80123 Napoli, Italy; Paul Holmes, Reuters News Service. Non-eruptive activity at the Mt. Somma-Vesuvius volcanic complex is characterized by low seismicity both in terms of energy and numbers of events; very few episodes of intense seismicity occurred during the last twenty years. In the last three years, however, hundreds of earthquakes have been detected with magnitudes ranging from -0.4 up to 3.4. The plot of monthly seismic events (figure 2) shows the usual fluctuating pattern observed at Vesuvius. The energy release distribution (figure 2) has a sharp peak coinciding with the 1995-96 earthquakes; the strain release curve also recorded two clear steps at these times. Figure 2. Monthly seismicity at Vesuvius during 1 Oct 1994-31 Aug 1996. The lower part of the figure shows the energy release histogram and the strain release curve. Courtesy of the Osservatorio Vesuviano. After the seismic crisis of March-April 1996 (BGVN 21:06), seismic activity decreased. During May-August 1996, the permanent seismic network of the Osservatorio Vesuviano recorded 266 microearthquakes, the strongest one had M 2.7. The events belonging to this sequence affected an extremely reduced volume below the crater area at shallow depth, with hypocenters rarely exceeding 6 kilometers below the sea. No changes in ground deformation or fumarolic gas composition were reported in the last field measurements. Information Contacts: Lucia Civetta, Francesca Bianco, Giuseppe Vilardo, and Mario Castellano, Osservatorio Vesuviano, Via Manzoni 249, 80123 Napoli, Italy. 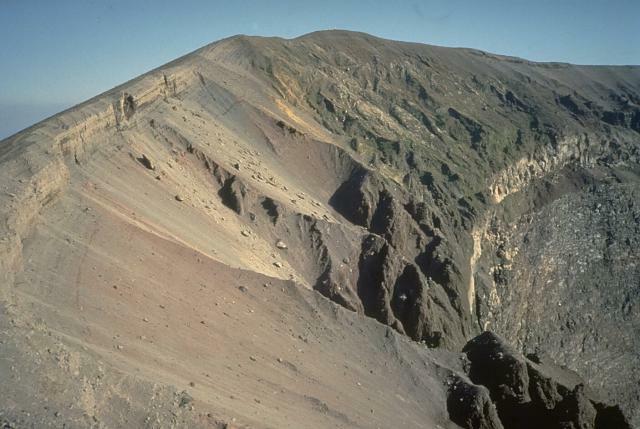 During late 1996 through early 1997 Somma-Vesuvius remained volcanically quiet and characterized by low seismicity both in terms of energy and number of events. A few episodes of moderate seismic activity have occurred in the last twenty years. The crisis of March-May 1996, characterized by an M 3.4 event (BGVN 21:08) was followed by a significant decrease of the seismic activity (figure 3). After the crisis, during June 1996-April 1997, 350 microearthquakes (maximum magnitude, 2.7) were recorded at the permanent seismic network of the Osservatorio Vesuviano. As has been typical in the past, foci appeared in a small volume below the crater area, rarely at depths below 6 km. Figure 3. Seismic activity at Vesuvius during the period 1 January 1996-30 April 1997, showing daily events (top), energy (histogram, bottom), and strain release (line, bottom). Courtesy of the Osservatorio Vesuviano. During January 1996-April 1997 the monthly temporal distribution of both earthquakes and their energy fluctuated, as had been the case in the past. The distribution of the cumulative strain release (figure 3) had its regular trend, disturbed only by the seismic crisis of March-May 1996. Both ground deformation and fumarolic gas composition data remained stable. 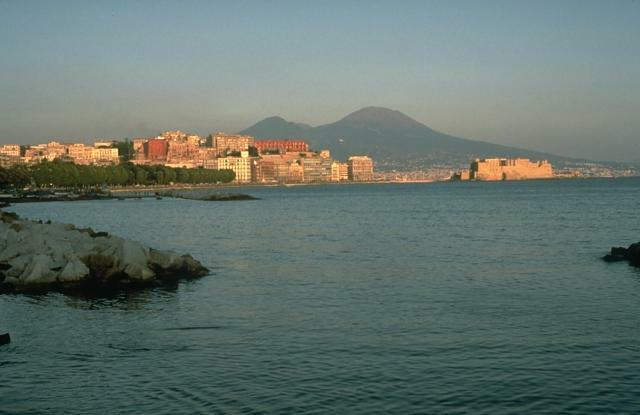 One of the world's most noted volcanoes, Vesuvius (Vesuvio) forms a dramatic backdrop to the Bay of Naples. The historically active cone of Vesuvius was constructed within a large caldera of the ancestral Monte Somma volcano, thought to have formed incrementally beginning about 17,000 years ago. The Monte Somma caldera wall has channeled lava flows and pyroclastic flows primarily to the south and west. Eight major explosive eruptions have taken place in the last 17,000 years, often accompanied by large pyroclastic flows and surges, such as during the well-known 79 CE Pompeii eruption. Intermittent eruptions since 79 CE were followed by a period of frequent long-term explosive and effusive eruptions beginning in 1631 and lasting until 1944. The 1631 eruption was the largest since 79 CE and produced devastating pyroclastic flows that reached as far as the coast and caused great destruction. Many towns are located on the volcano's flanks, and several million people live within areas potentially affected by eruptions of Vesuvius. This volcano is located within the Somma Vesuvio and Miglio d'oro, a UNESCO Biosphere Reserve property. Alfano G B, Friedlander I, 1929. La Storia del Vesuvio. Naples: K Holm, 71 p, 107 plates. Andronico D, Cioni R, 2002. Contrasting styles of Mount Vesuvius activity in the period between the Avellino and Pompeii plinian eruptions, and some implications for assessment of future hazards. Bull Volcanol, 64: 372-391. Arrighi S, Principe C, Rosi M, 2001. Violent strombolian and subplinian eruptions at Vesuvius during post-1631 activity. Bull Volcanol, 63: 126-150. Bertagnini A, Landi P, Rosi M, Vigliargio A, 1998. The Pomici de Base plinian eruption of Somma-Vesuvius. J. Volcanol. Geotherm. Res., 83: 219-239. Bruno P P G, Rapolla A, 1999. Study of the sub-surface structure of Somma-Vesuvius (Italy) by seismic reflection data. J. Volcanol. Geotherm. Res., 92: 373-387. Bullard F M, 1976. Volcanoes of the Earth. Austin: Univ Texas Press, 579 p.
Cioni R, Santacroce R, Sbrana A, 1999. Pyroclastic deposits as a guide for reconstructing the multi-stage evolution of the Somma-Vesuvius caldera. Bull Volcanol, 61: 207-222. Cioni R, Sulpizo R, Garruccio N, 2003. Variability of the eruption dynamics during a subplinian event: the Greenish Pumice eruption of Somma-Vesuvius (Italy). J. Volcanol. Geotherm. Res., 124: 89-114. Civetta L, Santacroce R, 1991. Steady state magma supply in the last 3400 years of Vesuvius activity. Acta Vulc, 2: 147-159. Delibrias G, Di Paola G M, Rosi M, Santacroce R, 1979. La storia eruttiva del complesso vulcanico Somma Vesuvio ricostruita dalle successioni piroclastiche del Monte Somma. Rendiconti Soc Italiana Min Petr, 35: 411-438. Di Vito M A, Sulpizio R, Zanchetta G, D'Orazio M, 2008. The late Pleistocene pyroclastic deposits of the Campanian Plain: new insights into the explosive activity of Neapolitan volcanoes. J. Volcanol. Geotherm. Res., 177: 19-48. Gurioli L, Houghton B R, Cashman K V, Cioni R, 2005. Complex changes in eruptive dynamics during the 79 AD eruption of Vesuvius. Bull Volcanol, 67: 144-159. Lirer L, Munno R, Postiglione I, Vinci A, Vitelli L, 1997. The A.D. 79 eruption as a future explosive scenario in the Vesuvian area: evaluation of associated risk. Bull Volcanol, 59: 112-124. Lirer L, Petrosino P, Alberico I, Postiglione I, 2001. Long-term volcanic hazard forecasts based on Somma-Vesuvio past eruptive activity. Bull Volcanol, 63: 45-60. Marianelli P, Metrich N, Sbrana A, 1999. Shallow and deep reservoirs involved in magma supply of the 1944 eruption of Vesuvius. Bull Volcanol, 61: 48-63. Mastrolorenzo G, Petrone P, Pappalardo L, Sheridan M F, 2006. The Avellino 3780-yr-B.P. 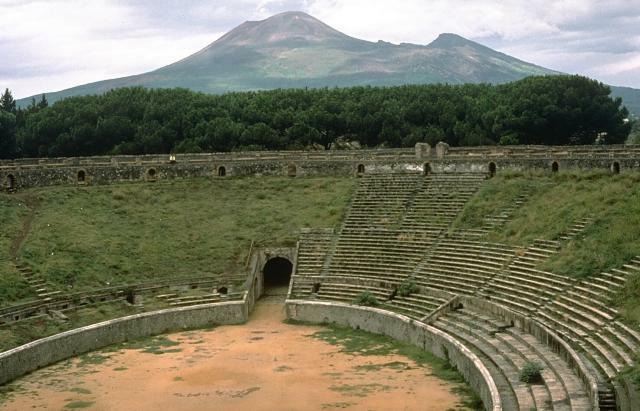 catastrophe as a worst-case scenario for a future eruption at Vesuvius. Proc Nat Acad Sci, 103: 4366-4370. Milia A, Mirabile L, Torrente M M, Dvorak J J, 1998. Volcanism offshore of Vesuvius volcano in Naples Bay. Bull Volcanol, 59: 404-413. Perrotta A, Scarpati C, Luongo G, Aoyagi M, 2006. Burial of Emperor Augustus' villa at Somma Vesuviana (Italy) by post-79 AD Vesuvius eruptions and reworked (lahars and stream flow) deposits. J. Volcanol. Geotherm. Res., 158: 445-466. Principe C, Marini L, 2008. Evolution of the Vesuvius magmatic-hydrothermal system before the 16 December 1631 eruption. J. Volcanol. Geotherm. Res., 171: 311-306. Principe C, Tanguy J-C, Arrighi S, Paiotti A, Le Goff M, Zoppi U, 2004. Chronology of Vesuvius' activity from A.D. 79 to 1631 based on archaeomagnetism of lavas and historical sources. Bull Volcanol, 66: 703-724. Rolandi G, Munno R, Postiglione I, 2004. The A.D. 472 eruption of the Somma volcano. J. Volcanol. Geotherm. Res., 129: 291-319. Rolandi G, Paone A, De Lascio M, Stefani G, 2008. The 79 AD eruption of Somma: the relationship between the date of the eruption and the southeast tephra dispersion. J. Volcanol. Geotherm. Res., 169: 87-98. Rolandi G, Petrosino P, McGeehin J, 1998. The interplinian activity at Somma-Vesuvius in the last 3500 years. J. Volcanol. Geotherm. Res., 82: 19-52. Rosi M, Santacroce R, Sbrana A, 1987. Geological Map of Somma-Vesuvius Volcanic Complex. CNR Progetto Finalizzato Geodinamica, Rome. Rosi M, Santacroce R, Sheridan M, 1981. Volcanic hazards of Vesuvius (Italy). Bull BRGM, 4: 169-179. Santacroce R , Cioni R, Marianelli P, Sbrana A, Sulpizio R, Zanchetta G, Donahue D J, Joron J L, 2008. Age and whole rock-glass compositions of proximal pyroclastics from the major explosive eruptions of Somma-Vesuvius: a review as a tool for distal tephrochronology. J. Volcanol. Geotherm. Res., 177: 1-18. Scandone R, Giacomelli L, Speranza F F, 2008. 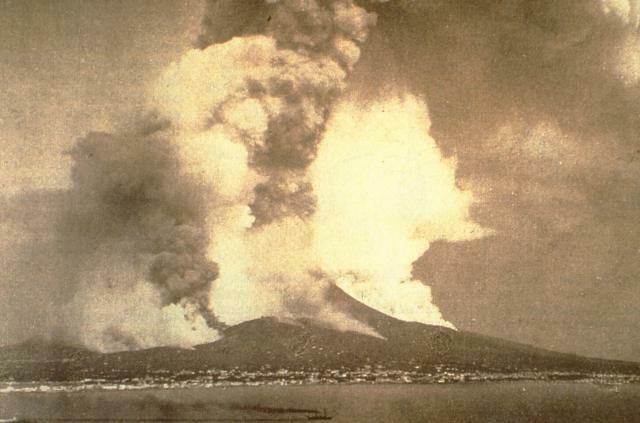 Persistent activity and violent strombolian eruptions at Vesuvius between 1631 and 1944. J. Volcanol. Geotherm. Res., 170: 167-180. Sulpizio R, Mele D, Dellino P, La Volpe L, 2005. A complex, subplinian-type eruption from low-viscosity, phonolitic to tephri-phonolitic magma: the AD 472 (Pollena) eruption of Somma-Vesuvius. Bull Volcanol, 67: 743-767. Trigila R, De Benedetti A A, 1993. Petrogenesis of Vesuvius historical lavas constrained by Pearce element ratios analysis and experimental phase equilibria. J. Volcanol. Geotherm. Res., 58: 315-343. There is data available for 61 Holocene eruptive periods. Remarks: Multidimensional Small Baseline Subset InSAR reveals long-term subsidence of Vesuvius with slight seasonal variations. A possible link to the Campi Flegrei system has been suggested. The Bay of Naples and the two volcanoes under study. a. Overview of the cumulative deformation retrieved by exploiting SAR data acquired by radar satellites from 1992 to 2008 and structural information after (Bianco et al., 1998). Green dots show radar pixels with little deformation, whereas red dots represent pixels with displacement values equal or larger than 10 cm. Note also the deforming girdle to the North of Vesuvius. The map shows the descending orbit data. b, c. Close up views of the two volcanic centers of Campi Flegrei and Vesuvius. d, e. Time series for pixels located in the Campi Flegrei caldera (Pozzuoli harbor area) and at Vesuvius (summit cone area). The long-term subsidence at both volcanoes is interrupted by short-term uplift periods, as in 2001 and 2006, suggesting a possibly correlated activity. Time series is shown for ascending and descending data. From: Walter et al. 2014. Reference List: Walter et al. 2014; Samsonov et al. 2014b. Samsonov, S. V., Gonzalez, P. J., Tiampo, K. F., Camacho, A. G., & Fernandez, J., 2014. 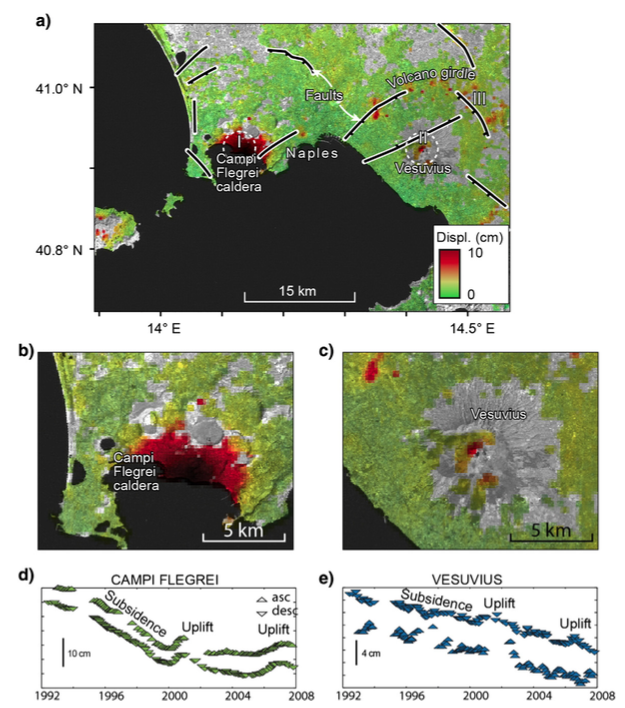 Spatiotemporal analysis of ground deformation at Campi Flegrei and Mt Vesuvius, Italy, observed by Envisat and Radarsat-2 InSAR during 2003-2013. In Mathematics of Planet Earth (pp. 377-382). Springer Berlin Heidelberg. There is no Emissions History data available for Vesuvius. 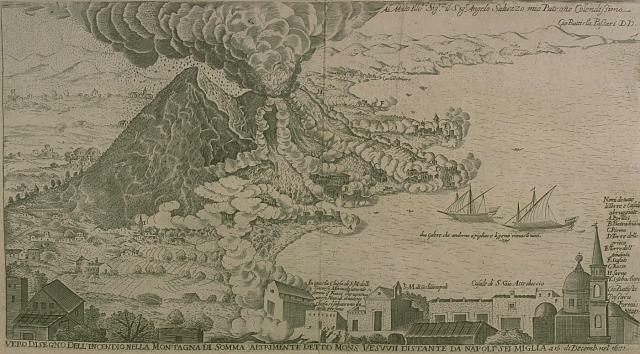 This engraving of the 1631 eruption of Vesuvius shows a vertical eruption column and pyroclastic flows sweeping down the flanks of the volcano to the sea. This is the earliest known depiction of pyroclastic flows, which were responsible for the fatalities at Pompei and Herculaneum during the 79 CE eruption. The 1631 eruption was one of the largest at Vesuvius in historical time and began the modern period of frequent, long-duration eruptions of Vesuvius. Engraving by G. Battista Passaro (from the collection of Maurice and Katia Krafft, published in Simkin and Siebert, 1994). An ash-rich eruption column rises above the summit of Vesuvius in 1944, near the end of a long-duration eruption that began in 1913. 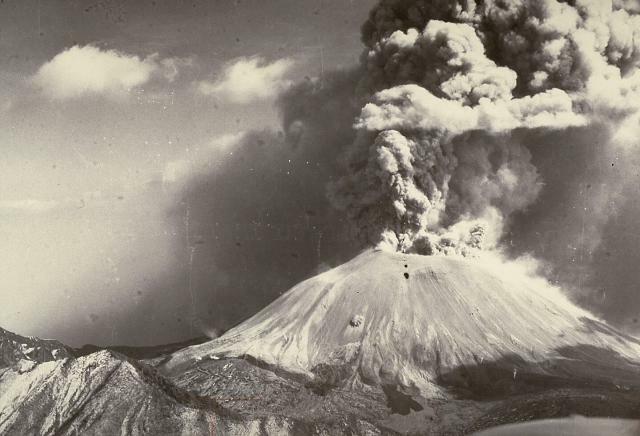 The 1944 eruption of Vesuvius included the emission of voluminous lava flows and vigorous explosions that left a 300-m-deep crater at the summit. It marked the end of the latest eruptive cycle of Vesuvius, which had begun in 1913 with long-duration lava effusion and strombolian eruptions. The paroxysmal phase began on March 18, 1944, and ended on April 4. Photo by U.S. Navy, 1944. This early photograph of Vesuvius looking east across the Bay of Naples depicts the major eruption of April 1872. A vigorous plinian eruption column rises from the summit crater, and ash columns also rise from a NW-flank fissure that fed a lava flow that traveled far down the west flank, overrunning several villages. Steam also rises above another lava flow below and to the right of the summit. This eruption began with lava effusion in December 1870. Photo courtesty of Roberto Scandone (University of Rome). 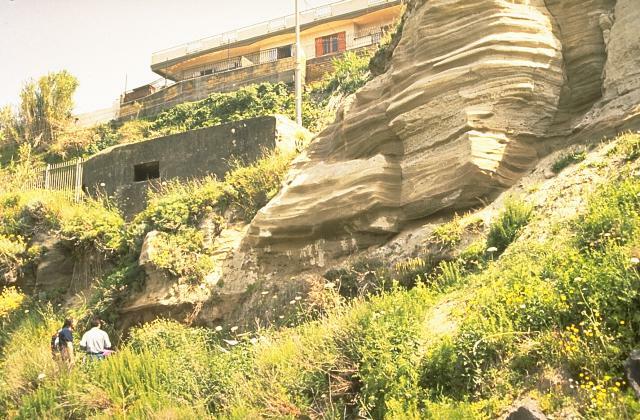 The bedded layers at the right, near the town of Torre de Greco on the south flank of Vesuvius, are pyroclastic-surge deposits from the Avellino eruption, dated about 3700 years ago. This eruption, one of eight major explosive eruptions since formation of the Monte Somma caldera, produced 2.9 cu km of airfall tephra. Pyroclastic surges (1 cu km) swept all sides of the volcano and traveled as far as 22 km to the NW, covering an area now overlain by much of the city of Naples. Photo by Roberto Scandone (University of Rome). The dark-colored lava flow filling the caldera moat between the cone of Vesuvius and the caldera wall of Monte Somma in the background was erupted in 1944, near the end of the eruptive cycle that began in 1913. Photo by Roberto Scandone, 1989 (University of Rome). The upper crater rim of Vesuvius is capped by thick tephra deposits from its last eruption in 1944. The bedded tephra layers overlie a light-colored layer at the right, a lava flow that had been erupted earlier during the 1944 eruption. The steep wall beneath the 1944 lava flow is cut through pre-1944 lava flows. Mount Vesuvius rises above an excavated stadium in the buried city of Pompeii. The 79 CE eruption began on August 24 with phreatomagmatic explosions that produced widespread ashfall. Many residents of Pompei and other towns had evacuated prior to the onset of devastating pyroclastic flows the following day that swept over broad areas as far as 30 km from the volcano and caused thousands of fatalities. Photo by Dan Dzurisin (U.S. Geological Survey), 1983. Mount Vesuvius provides a backdrop to the city of Naples. The modern cone of Vesuvius is flanked on the left by Monte Somma, the rim of a caldera that formed about 17,000 years ago. Eight major explosive eruptions have occurred since, including the 79 CE eruption that destroyed Pompeii and other towns. A period of frequent, long-duration eruptions began in 1631. The latest eruption of Vesuvius was in 1944. The following 1344 samples associated with this volcano can be found in the Smithsonian's NMNH Department of Mineral Sciences collections, and may be availble for research (contact the Rock and Ore Collections Manager). Catalog number links will open a window with more information. Large Eruptions of Vesuvius Information about large Quaternary eruptions (VEI >= 4) is cataloged in the Large Magnitude Explosive Volcanic Eruptions (LaMEVE) database of the Volcano Global Risk Identification and Analysis Project (VOGRIPA).